What's up, DooMTV? It's MC Nervous Breakdown here with a fresh new episode of Pimp My Attic, the show which turns your attic into the place for britches and hose. This week we're taking a look at an attic in serious need of repair, revamping and revampiring, currently under the ownership of a lady with buns who often has the tendency to say lots of words and things. 1 This is my attic. 2 Needs more scary things. 3 Needs more naughty things. 4 Needs more calamitous things. 5 So, how do you like your new attic? 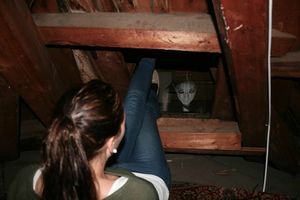 Today we're going to talk about things in your attic that you should really fear. Haven't you ever seen it before? Surely you must've seen it before because I'm rather sure you visited my attic that time when you were trying to run away from the rabid crocodiles I'd picked up from the nature hike the other day. Anyway, as I was saying, my attic seems incredibly boring. There's nothing really all fantastic about it, and there's nothing scary about it either. It wasn't even nearly as exciting as that time I visited the funhouse at the county fair. Those were some rather frightening clowns, though. I wonder if those would look any good in my attic... perhaps they would. As I was saying, I really hope you choose to, uh, 'pimp' my attic, as you would say. It would make a reasonable client, don't you think? Might I suggest spiders? They're rather small and convenient for travel, despite being mildly poisonous, and can actually sometimes be almost cute. If you want anything cuter, I could offer you feral bunnies. How about the occasional trapdoor here and there? I'm not talking about that Trap Door show, but that's actually just as creepy and would make a decent substitute. I don't think I wanna know which items people keep in their attic that vaguely fit this description. All I'm thinking is that if he's going to end up putting his rubber duck in her bathtub, he's gonna have to get that duck from somewhere, even if it is a few years old and covered in dust. I am afraid of dust, just as I am afraid of naughty things being kept in the attic. They seem almost the same as scary things, but their difference to those is that they are not inherently scary, but rather have the potential to cause great damage to the rest of your house. If not installing trapdoors, why not settle for some really poorly-installed scaffolding instead? Here to assist us with the equipment of calamitous things is this episode's celebrity guest star, the guy from the shopping infomercials channel. That's right — with every order of poorly-installed scaffolding for £15.99, you'll receive a free giraffe as a token of our service to you. And if you pay by credit card, we'll throw in a another two hippos for the reduced price of ₩50 each! H€¥! Lions and tigers and bears, oh, pickles. So, how do you like your new attic? It's... it's alright, I guess. Probably needs another landline phone in there, though. This page was last edited on 18 Jumbly 2014, at 03:17.